Our Epoxy coating is a cathodic dip-paint coat (KTL). Unlike our Epoxy varnishing technique and the NiCu Epoxy coating, the Epoxy KTL coating features special stability in moist environments and in contact with weak acids as well as alkaline and saline solutions. Due to these properties, the Epoxy KTL coating is highly recommended for applications in tidal power plants and Offshore-wind turbines. Furthermore, the KTL coating offers a significantly better strip-off performance for glue-sheer off tests. The galvanic nickel plating is a widespread method to coat sintered NdFeB-magnets. The coating is applied to the magnet in three layers: A basic Ni-layer, middle Cu- and at last a covering Ni-layer. The galvanic nickel plating has advantages considering the rigidity of the surface, the cost-effective production and the outstanding stability in moist environments and under high temperature. On the other hand, it is difficult to meter the thickness of the layers. Additionally, the method results in a problematic adhesion and in a loss of magnetic flow caused by short circuits. This process is similar to the galvanic nickel electroplating. Unlike the galvanic nickel surface coating, the final Nickel layer is plotted chemically. This technique results in improved corrosion protection under the terms of sterilization, a reduced loss of the magnetic flux and enhanced adhesive properties. The cost-effective galvanized Nickel-Tin process is suited for applications in a wet environment that require an increased adhesive property. The reduced hardness of the final Tin layer has a disadvantageous effect. It especially exacerbates the handling of magnetized items. 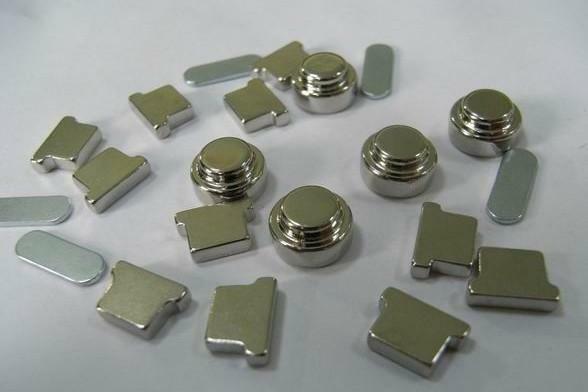 The zinc coating of NdFeB magnets is a widespread technique. It is the custom that a chromate coating is applied to the galvanized parts in a special bath. The customer can decide between a blue and a yellow chromate coating. The Cr+6 –rich, “yellow” coating is not applied in the automotive- and ROHS-conform production anymore, due to its manufacturing processes that are hazardous to health. The customer can fall back on the “blue”, sometimes called “white”, chromate coating. This coating offers lower corrosion protection compared to the properties of the “yellow” coating. On the other hand, it excludes impairments of human health and damages to the environment. The zinc coating can only be recommended for temperatures up to 80° C, due to its mechanical stability. The simple identification of coating thickness and the good handling make this technique very attractive. The process is most appropriate in cases of zinc-coated carrier material.